Your windows do a lot more than just let you look outside every now and then. They offer protection to your home as well, by keeping moisture, wind and UV rays out. Windows with higher R-values can keep your house warmer by allowing the warmth of the sun in during colder months. When the weather is nice, opening windows to let in fresh air is wonderful, provided your screens are in tact. When windows are damaged or broken, moisture and pests are invited into your home. If this occurs, it’s a good idea to put your trust in LYF Construction, a business specializing in window repairs since 2003. Call today for a free estimate to repair your windows at (832) 304-6764. If you’re curious about your windows, the shape they are in and whether it's time to have them looked at, here are four signs it’s time for window repair. If you recognize any of these issues below, call the window repair pros at (832) 304-6764. 1. Windows are cracked or broken. If you notice physical cracks or breaks in your windows, then you must have them replaced or repaired by a professional. A broken window not only lets in bugs and allows cold air out in summer and warm air out in winter, but it can also be a very dangerous safety hazard. If you notice a crack in your window, even a very small one, it’s important to have it repaired as soon as possible so it doesn’t spread into something worse or actually break. While your windows can let in a beautiful view or make your home more comfortable in terms of temperature, a leaking window is a very bad thing and should be addressed right away. A leaking window not only lets cold air out of your house in the summer or warm air out in the winter, but it can also let in water when it’s raining. If this occurs, the rain water can seep into your walls, and if left untreated, can cause rotting that turns into a more expensive project to fix. If you notice any leaking, have your windows repaired right away. 3. Your energy bills are too high. If you notice your energy bills are excessive in price, it’s likely you’re wasting too much energy. Sometimes the root cause of this expense is poorly insulated windows. When windows aren’t insulated or sealed properly, they don’t keep energy inside your home. This causes your energy bills to rise. However, if you have your windows repaired or replaced with those that are more energy efficient, you’ll notice a lower energy bill. 4. Windows are hard to open or close. 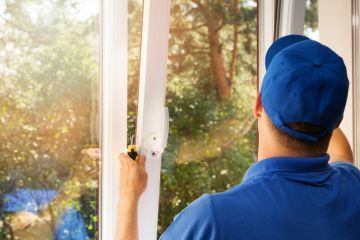 Being able to open your windows is important, but if it becomes too difficult or impossible to open them, then it’s time to have them repaired or replaced by a trusted professional. When you allow LYF Construction to provide the window repair services you need, you’ll experience high-quality service and affordable pricing all in one. And since we’ve been in business for 16 years, you can rest assured we know how to treat every window problem that comes your way. Contact us today at (832) 304-6764 to schedule your appointment.